Emory President Claire E. Sterk (left) poses with some of this year’s Award of Distinction winners at an Oct. 18 dinner in their honor. 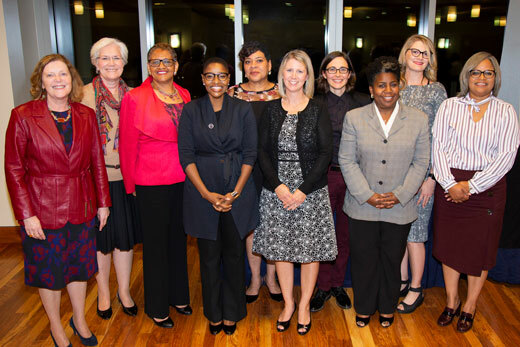 They include (left to right) Julie Barefoot, Marilyn Lineberger, Anjulet Tucker, Tammyjo Best, Michelle James, Danielle Bruce-Steele, Susan Newborn, Maya Meeks and Tamika Kendrik. Twelve employees have been selected as this year's winners of the Emory University Award of Distinction. Since 1985, the award has annually recognized staff members who have made outstanding contributions to the Emory community. Honorees were celebrated at an Oct. 18 dinner with Emory President Claire E. Sterk and received a $1,000 award. Julie Barefoot’s contributions to the Goizueta Business School encompass a 30-year career in the MBA Admissions office. As the associate dean of engagement and partnerships, Barefoot is deeply committed to ensuring the best education is delivered to each student. Not only has she streamlined the admissions process, she has also built lasting relationships along the way. It is due to these relationships and her leadership that Goizueta is consistently ranked as one of the top 20 business schools. Barefoot has been instrumental in developing additional programs within the MBA office to ensure that Goizueta’s graduates are well prepared for the future as they enter the workforce. She has also helped implement several new programs that serve the needs of today’s business leaders: the evening MBA program, executive education programs for weekend and modular schedules, and a Master’s of Business in Business Analytics program to develop data scientists. Because of her tenure, her passion for Goizueta, and the relationships she has built with alumni around the globe, Barefoot has been given the honor of leading Goizueta Business School’s 100th Anniversary celebration. Her relationships within the Goizueta community are strong building blocks in moving forward in the celebration of such a monumental point in the school’s history. By continuing to explore growth potential for the future while maintaining her special and personal touch, Barefoot has helped create a community built for success. Working as an LPN in the School of Medicine’s Department of Neurology, Tammyjo Best serves as the program coordinator for many initiatives within the Movement Disorders Program, including the Merrie Boone Comprehensive Care Clinic for Parkinson’s Disease. This highly innovative clinic has positively impacted the quality of life for patients with Parkinson’s disease and their family members by creating a patient-centered approach to incorporate multidisciplinary care for the range of motor and non-motor symptoms that commonly occur. Best was instrumental in the clinic’s initial setup in 2010 and it is through her leadership and organizational abilities that it has been so successful. She integrates the clinical care of patients through several disciplines including psychiatry, neuropsychology, sleep disorders, geriatric medicine, social services and rehabilitation medicine. She is responsible for organizing schedules and communicating with patients and families. She cheerfully greets them each morning of their two-day visit and helps them navigate through their busy appointment-filled days at the Brain Health Center, including five appointments on day 1 and four appointments on day 2. Best is the glue that holds together the providers and the patients they serve. She truly embraces the spirit of “One Emory” as evidenced by her ability to work across multiple disciplines to unite them towards the goal of providing optimum care for persons living with Parkinson’s disease. Danielle Bruce-Steele serves as the director of the Office of LGBT Life, Belonging and Community Justice, where she provides critical support for Emory’s students and student groups. She does this with a “student-first” perspective, supporting students when they are struggling and challenging them to consider different perspectives when helping to build more diverse and sustainable communities. The focus of these discussions range from identity development to academic challenges. Originally hired as a program coordinator, Bruce-Steele has moved up through the organization to become the director. Throughout her career, she has stepped up to help in times of transitions. For nearly two years, she served as both the assistant director and interim director for the Office of LGBT Life and during this same time, took on a third role to serve as the interim director of the Center for Women. Her other accomplishments include serving as a hearing officer for the Office of Student Conduct; working with several departments to implement the Intersections curriculum; serving as a facilitator for Creating Emory; chairing multiple search committees; volunteering for countless Campus Life events; and serving as a Title IX investigator. Recently, she worked with an Emory Law student to propose the creation of the Emory LGBTQ Legal Services (ELLS). This extremely complicated process involved alumni, community nonprofit organizations, faculty and many others. ELLS now provides LGBTQ legal services in the community. Bruce-Steele is a recipient of the Emory Campus Life John L. Ford Ethical Leadership Award. As a major gifts officer for Winship Cancer Institute, Jennifer Daly works with patients and families in crisis. Her job is to promote philanthropy, which she does with tact and skill, but she routinely goes above and beyond her normal job duties by reaching out to families and forming personal relationships. Truly committed to making sure that everyone who comes to Winship receives the best treatment and care possible during his or her cancer journey, she navigates appointments, meets patients when they arrive for treatment and visits them in the hospital. She maintains contact with the families, in person and through handwritten notes, making sure their needs are met. She emails physicians before a patient arrives with just enough detail to make the visit comfortable for the patient and physician alike. The same holds true for faculty. No medical professional goes into a visit with one of Daly’s prospects without a briefing on any subject which might arise. Through a number of personnel changes in the past several years, Daly has also become the spokesperson for Winship’s team. In the absence of a CDO, she willingly assumed the leadership duties required of that position while continuing to serve her own donor pool. Colleagues appreciate her knowledge and positive attitude, physicians rely on her navigation skills and donors depend on her unwavering support in all situations. Daly is advancing relationships that extend beyond an individual’s cancer journey — she is creating legacies every day. Michelle B. James is a senior director of alumni and constituent relations for Rollins School of Public Health. Under her leadership, alumni programming and engagement at Rollins have expanded across Atlanta and to multiple cities. As the number of Rollins alumni grows to nearly 10,000, James has managed to increase her engagement numbers. Last fall, she organized the largest alumni awards reception in Rollins history, with more than 400 alumni attending. She continually introduces innovative opportunities that connect Rollins students and alumni, including Pathways to Public Health, the Rollins Mentoring Program, Mock Interview Night and Rollins@work. She is also a generous mentor to students, frequently meeting with them as they explore their public health career options and connecting them with alumni all over the world to help guide them to their chosen field. James is an essential reason why Rollins’ students feel a strong sense of community and stay excited about Emory long after they leave campus. James not only builds bridges across Rollins and Emory, she also connects employers and community partners with the university. Last year, she established the CDC Employee Association of Emory Alumni, which actively engages the 1,200 Emory alumni who work for the U.S. Centers for Disease Control. In doing so, she has created an alumni association that enables direct communication, builds visibility and strengthens mentoring and networking programs with one of Emory’s most valuable public partners. Serving as a communications manager for the Emory Police Department, Tamika Kendrick manages a team of dispatchers at the EPD Emergency Communications Center where all police calls are prioritized, recorded and dispatched. She also serves as a regional team lead for the Georgia Emergency Management Agency (GEMA), which maintains teams of Georgia 911 operators (Telecommunications Emergency Response Teams) to provide disaster assistance. In disaster situations, 911 operators are often overrun and unable to handle the tremendous volume of calls, so these GEMA teams are dispatched to help. In September 2017, when the state of Florida was recovering from the devastation of Hurricane Irma, Collier County was one of the hardest hit areas. Public safety entities serving the area struggled to provide emergency assistance. Kendrick was among six dispatchers from Georgia who were asked to help. She traveled to Florida where she spent seven days at a temporary emergency communications center, working around the clock to provide the Collier County staff the relief and support they needed. She worked 12-hour shifts and slept on an air mattress in order to help the department handle five times the normal volume of emergency calls. She answered, dispatched and processed emergency calls, she brought meals to local 911 staff, and helped to counsel and coach the employees, many of whom had been impacted personally by the storm. Throughout his 27-year career at Emory, Bill Lambert has served in many influential roles which have helped strengthen the university. As an associate vice president for finance, grants and contracts within the Finance Division, Lambert continually identifies opportunities for improvement. When he recognized the need to reduce the backlog of award processing, he established a cross-functional team and initiated an award process system enhancement in Compass to reduce processing time from 14 to four days. This allowed for more than $700 million award contracts to be processed, mitigated the risk associated with the research community and greatly increased operational efficiencies. Lambert also contributed to a 50 percent reduction in the Cash Application Project which allocated more than $9 million unapplied dollars to the appropriate awards. He also served on the Enterprise Finance Network committee which created the Business Leadership Program (BLP), a talent development program for high-potential business managers designed to foster and develop future leaders. He currently serves as a mentor for this program, providing experiential development opportunities for BLP participants. Lambert is leading two projects that will have a lasting effect on Emory: a sponsored award lifestyle project to create a holistic approach to the Emory award process and implementing a career pathing program to allow Finance Division employees to maximize their current role and create a long-lasting career path at Emory. Marilyn Hazzard Lineberger began her career at Emory University in 1980 as an assistant professor of clinical psychology in the Department of Psychology. In 1985, she was approached about developing a proposal to establish the Emory Employee Assistance Program. The proposal was approved and the program opened its doors in 1986. Lineberger served as a consultant and the first clinician for the program. Over the years, she has provided behavioral mental health and team dynamics services for both Emory University and Emory Healthcare. She has supported many individuals and teams, promoting emotional and organizational health for Emory’s workforce. Today, Lineberger continues to serve the organization, now known as the Faculty Staff Assistance Program, in the role of director of FSAP Services. Realizing the growing demand for retirement support services, she began to develop expertise in the area of retirement coaching and then used her knowledge to help implement new programs at Emory. She developed and facilitated new workshops on the emotional aspects of the retirement journey; created a pre-retirement session for Emory Healthcare employees; contributed to the development of the university’s Emeritus College Retirement Mentorship Program; and helped create a Train-the-Trainer Program for retirement mentors who now offer individual coaching to both faculty and staff pre-retirees. Lineberger’s focus in the area of pre-retirement preparation and planning is now a very important resource at Emory. As a veterinary technician IV in the Division of Animal Resources (DAR), Maya Encantada Meeks runs the diagnostic lab, which performs clinical pathology services for both DAR and Emory research personnel. She also serves as the manager of the quality assurance (QA) program, which encompasses all of DAR’s efforts to maintain biosecurity in the animal colonies. Managing all of these processes requires effective time management, high attention to detail and coordination with dozens of individuals both within and outside of the DAR for sample collection, submission and processing. Over the past year, Meeks has effectively handled more than 10,000 samples. A significant benefit to the DAR budget is that she works tirelessly to gain favorable pricing on services from commercial and academic partners. Meeks also works as a passionate advocate and supporter of Emory’s sustainability efforts. She serves as the Whitehead Biomedical Research Building (WBRB) sustainability representative to the university. She has been vital to the success of the Green Labs Initiative; the DAR laboratory was the first at Emory to achieve platinum level status. WBRB is Emory’s largest and most complex animal housing facility and Meeks is currently working with a team to achieve zero landfill status. In recognition of her contributions, Meeks was awarded the Robert S. Hascall Staff Sustainability Innovator Award in 2017. She was also recently chosen to serve as a Georgia representative to the International Institute for Sustainable Laboratories. After working for many years with Emory University’s Human Resources Division, Susan Newborn took on the role of director of Human Resources at Oxford College in 2016. In this short time, she has quickly become a great resource to the Oxford staff and faculty. She has guided dozens of faculty candidates through the intense search process, helping some hires to navigate the visa and citizenship processes. She spends countless hours to make sure benefits are applied appropriately. As an independent mediator, she has mentored campus managers and leaders, tirelessly working to create a campus culture that is accepting, encouraging and open. Some of Newborn’s most crucial work has focused on creating more opportunities for staff, an effort which has extended far beyond her service on the Oxford Staff Organization Board. She created the Growing Pathways to Success program, which has made professional development available to everyone across campus. She also brought the university’s Staff Fest event to Oxford. Since most staff cannot leave during the workday to participate in the Atlanta campus event, having Staff Fest at Oxford has been an incredible boost to morale. Newborn has also improved employee retention, striving to keep talented people at Oxford: familiar faces will pop up in another part of campus or an announced departure doesn’t end up happening. She has brought people together and partnered with every department, group and division on campus to create a better Oxford. Donna Troka serves as the senior associate director of teaching and pedagogy for Emory’s Center for Faculty Development and Excellence (CFDE) where she has made exceptional contributions to advancing the quality of teaching at Emory. She has personally worked with several hundred faculty over the past decade in one-on-one teaching consultations. She has developed workshops on pedagogy reaching many faculty and graduate students. This summer, she led a workshop on inclusive pedagogy, a subject on which she is one of Emory’s top experts. She helped develop several CFDE grants related to teaching activities, and often works with faculty to hone their ideas for these grants. She also organizes many other CFDE activities related to teaching. Her creativity and enthusiasm are crucial to the success of these activities. Troka has improved and advanced the university’s commitment to diversity, equity and inclusion in multiple ways: she was a member of the hiring committee for the director of diversity programs; she served on the Inclusive Campus Working Group, helping to improve faculty hiring practices at Emory; and she is a member of Emory’s Committee on Community and Diversity, where she serves on the planning committee for hiring a new chief diversity officer for Emory University. In CFDE, Troka has created an entire portfolio on inclusive pedagogy which seeks to help faculty across the university work through challenging conversations in the classroom and be up-to-date on current best practices around inclusive and participatory classrooms. As director of programs in the Office of the President, Anjulet V. Tucker manages time-sensitive engagement projects, key outreach efforts, and relationships that connect students and staff to the university president and vice versa. As an Emory alumna herself, she has the unique ability to understand the needs, aspirations and concerns of both the Emory student and staff community. The relationships she has formed across campus have led to successful new partnerships for the Office of the President. She conceptualized and implemented the Emerging University Priorities Week that engaged hundreds of students, faculty and staff across campus; she orchestrated a partnership between the Office of the President and the Emory Alumni Association to execute a strategic student funding program; and she designed and launched a suite of student-focused programs, including Student Coffee Hour and Student Organization Office Hours, to introduce the president to emerging leaders on campus. She also collaborated with the Alumni Relations team on presidential engagement tours in Houston, Dallas and Chicago. Tucker advocates for students who might otherwise slip through the cracks and she understands what it is to be a woman of color in a university setting where not many role models have historically been available. She takes her role seriously, always willing to share her time with students who admire, look up to her, and see her as someone they could aspire to become one day.